Every Step, Another Story: Fundraising, fundraising, fundraising! You may have noticed on my last blog post that I am becoming heavily involved in fundraising for the student mental health charity Student Minds. I am thrilled to say that as a society at Sheffield Hallam University, our first quiz bingo fundraising event went incredibly well and we raised a fantastic £45 for the charity! However, the event meant so much more than just raising money, it allowed people to enjoy a sociable night out with their friends, and I can say that on behalf of the society committee members, we really enjoyed meeting lots of new people! So a huge thank you to everybody that turned up and I hope that you had an enjoyable evening. 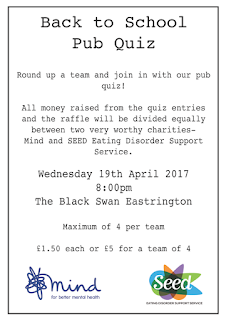 Finally, on Wednesday 19th April 2017 I will be hosting a pub quiz and raffle at The Black Swan in Eastrington to raise money for another two charities that mean so much to me- Mind and SEED Eating Disorder Support Service. This will be another opportunity for me to pay them back for all of the support they have given me throughout my time in recovery. However, the event will be more of an excuse for me to have a catch up with everyone at home as I make my way back for the Easter break! 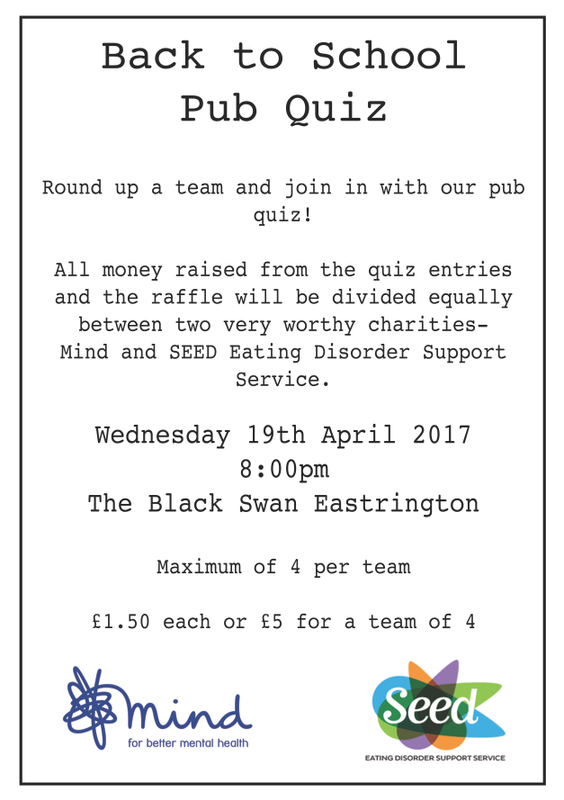 Even if you do not take part in the quiz, I really hope that you will come and say hello! It goes without saying that any donations for any of these charities are extremely worthwhile to help support the fantastic work that they do. I completely appreciate that money is precious and that I am doing a lot of fundraising at the moment, but this is because I love feeling as though I am doing my bit to make a difference. I do not expect masses of donations- a small amount of money can go a long way in helping somebody or a group of people. I want to take this opportunity to thank everybody for their continual support throughout all of my fundraising efforts and I hope that I can continue playing my part in making improvements to mental health charities and the support they can offer. The work you do for these charities is quite remarkable. I wish more people would put in the time and effort to help out a good cause. It may seem like hard work, but all it takes is just some time out of your day to help raise money and awareness for these charities. Thank you Neal, that is very kind of you. I love fundraising and truly enjoy the process of organising an event and seeing it succeed to help out some very deserving charities.